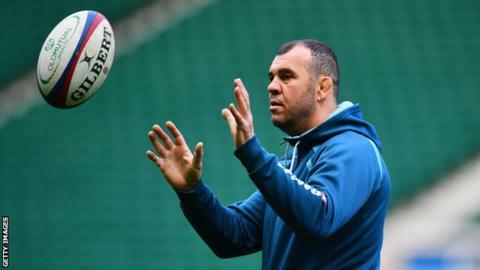 Australia head coach Michael Cheika is being investigated over his comments and conduct during the Wallabies' match against England on Saturday. World Rugby, the game's governing body, has referred the case to the autumn internationals disciplinary authorities, who are investigating. Cheika, 50, reacted angrily to a series of decisions that went against his side in the 30-6 defeat at Twickenham. He was also was involved in an exchange with a supporter just before half-time. In a post-match interview with BBC Radio 5 live, Cheika was reluctant to be drawn on the role of the officials, saying Australian rugby operates a "no-excuses culture". The Wallabies lost captain Michael Hooper and full-back Kurtley Beale to first-half yellow cards and had two tries disallowed as a series of marginal calls went against them. Both sides got a few harsh calls against them but I think we edged it on the good calls. I think the Michael Hooper yellow card seemed a little bit harsh. With their tries that were disallowed, I think technically to the letter of the law they were probably all the right calls. Read more on England 30-6 Australia: Controversy, rancour and a home win - what more can you ask for?